Center aims to realize a “green energy system” using “hydrogen fuel” in Tokyo. We promote research and development of hydrogen fuel cells and the necessary infrastructure, such as a network of hydrogen refueling stations, and hydrogen production and carrier systems. Center regularly holds seminars and international symposium regarding hydrogen energy. "The 3rd International Symposium on Hydrogen Energy‒based Society" will be held on Minami-osawa campus, Tokyo Metropolitan University. 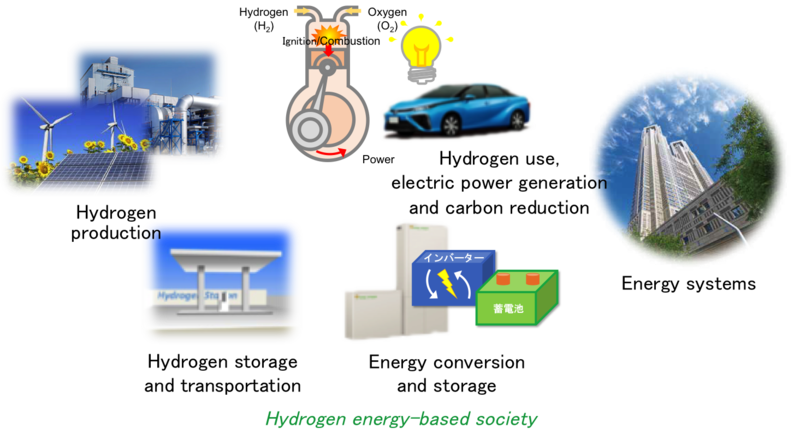 "The 2nd International Symposium on Hydrogen Energy‒based Society" will be held on Minami-osawa campus, Tokyo Metropolitan University. Nikkei Sangyo Shimbun published an article on the reseraches in ReHES at 2017.4.25. TOKYO MX「Tokyo Crasso！NEO」broadcasted on the reseraches in ReHES at2017.3.12. Center aims to realize a “green energy system” using “hydrogen fuel” in Tokyo. We promote research and development of hydrogen fuel cells and the necessary infrastructure, such as a network of hydrogen refueling stations, and hydrogen production and carrier systems. Six research groups will provide comprehensive and cross-cutting research for the realization of a “hydrogen energy society” across a wide range of disciplines. A renewed website was launch. Copyright © Research Center for Hydrogen Energy-based Society (ReHES), All Rights Reserved.